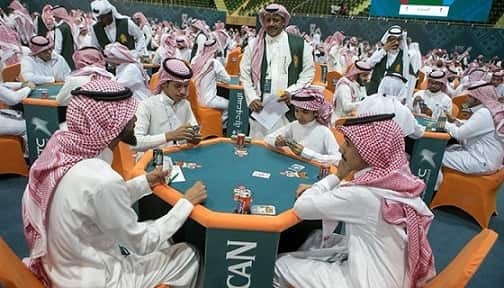 - Saudi Arabia has conducted its first maiden championship of 'Baloot' most popular card game, More than 85,000 people have registered for playing this game out of which 12,288 were selected to play on 384 tables for championship as per Saudi Gazette report. - The event is organized with the full support of the Board Chairman of the General Sport Authority (GSA) and President of Saudi Arabian Olympic Committee with financial awards of 1 Million Saudi Riyals. - It is a game of mind skills and its an opportunity for both Saudi man and woman to show their skills in their leisure hours. Baloot is one of indoor game played by all age groups in Saudi Arabia. It is most common in youth where they gather and play Baloot in their free time. - Baloot is a game of 4 Players in partnership with 2 teams, All the cards of rank 6 and below will be removed including Jokers, The game will be played with 32 cards each player will get 8 cards in his hand. It is even available online an in many gaming portals and mobile apps.